The temperatures were hovering near 80, but there definitely was a "Christmas in June" vibe at last night's Digital Experience in New York, sponsored by Pepcom. More than 50 companies were showing off their latest digital products to the press, hoping to get some additional eyeballs and coverage as we start preparing the end-of-year gift guides and other such features. The event was also a prelude to next week's CE Week in New York, in which we'll see even more gadgets and gizmos. I saw an increase in the amount of "connected home" devices - the market here is boosted by people talking about "The Internet of Things", as well as the realization that Wi-Fi and cloud-based services are resonating more with consumers than older technologies (such as Zigbee or Z-wave, etc.). At last night's event I saw connected thermostats (the Lyric Wi-Fi thermostat from Honeywell), moisture/humidity sensors (from Wally Home), and motion sensors (from D-Link), amongst other systems. The popularity of the Nest thermostat (and subsequent purchase by Google) means we'll likely see more connected home gadgets the rest of this year and next. 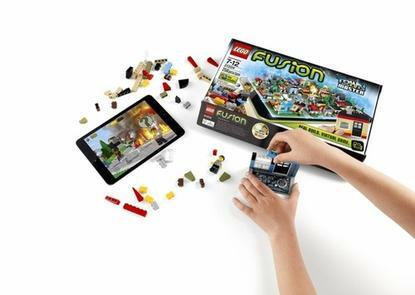 Lego Fusion: It's bad enough that my three kids are addicted to their LEGO sets (and video games), now comes a bunch of LEGO Fusion sets, which combines the physical world of building blocks with the virtual world of a tablet/phone app. The $35 sets will include a bunch of bricks, that interact with special base plates that trigger the app (after you point the tablet's camera at it). Whatever is constructed on the base plate then gets converted into the app - you don't need to build anything perfectly, which should appeal to the more imaginative types out there. The first three sets include a town-building game (Town Master), a racing game (Create and Race) and tower-defense game (Battle Tower). The company will also roll out a Lego Friends-version (Resort Designer) of the app/game in September, which my two daughters will likely flock to as well. Drop, the iPad-connected kitchen scale: Last year I had the pleasure of trying out Brookstone's iPad connected bartending app and scale, which helped amateur mixologists create their favorite cocktails. Now comes this device from Drop, a kitchen scale that will help you become a better baker. The scale connects to your iPad via Bluetooth, identifying the weights of foods or ingredients that you place onto it. However, the beauty is in the app, which includes a database of different recipes and helps you create the dish with the right amounts. If you don't have enough of the ingredients for the recipe, the app can re-adjust the amounts of other ingredients, or it can suggest alternatives (for example, replacing butter with lemon juice or sour cream). As long as you can avoid getting flour and sugar on your iPad, this should become a valuable kitchen tool for aspiring chefs. Oplink Connected WiseHome: As mentioned earlier, connected home devices were plentiful at the event, including a bunch of different offerings in the WiseHome series. The company was showing off Wi-Fi-enabled sensors such as motion detectors, multi-function video cameras, heat/noise sensors, smart plugs (turning lights on/off) and more. Two sensors I found cool - the two-way audio camera, which offers two-way communication between someone talking to the camera and a second person located somewhere else; and the SmartAlert Button, which can be used in home health care scenarios. With the audio camera, my kids could talk with me while I'm at work and I could respond via Oplink's smartphone or tablet app. And the SmartAlert Button helps trigger notifications for someone who needs assistance (like for an elderly person or child who needs help). Neat stuff. LifeTrak fitness watches: There are a ton of "activity monitors" and other fitness devices out there that monitor your steps, your sleep and other health-related activities, but heart-rate monitors have always been things that you've worn on your chest or connected to a bar on a treadmill. LifeTrak was showing off some of its new watches that help monitor heart rate, sleep, steps and other activities in a very attractive and lightweight design. Memloom: Telling stories to your friends and family via social media likely involves you uploading individual photos into a slide-show or photo album-type format, with any text limited to captions in each of the photos. More ambitious types even attempt to upload video to the sites, but they're usually very small clips without much context. Memloom wants to help people integrate their storytelling in a more interesting way, turning "your photos and videos into stories that will never fade or get lost." The service integrates photos, videos, audio and text into a package that can be easily shared with friends/family (you get to share these privately if you want) via Facebook or email. I think this will be a hit with family members looking to create legacy pages for other family members who have passed on, as well as a way for people to share vacation stories that go just beyond a bunch of pictures. Kodak PIXPRO Smart Lens (SL10 and SL25) : Several companies were showing off new digital cameras at the event (including Nikon and Samsung), but at the Kodak table they were showing off something very cool - the PIXPRO Smart Lens models (SL10 and SL25) have no display - rather they snap onto your smartphone (iOS and Android supported). Communicating via Wi-Fi to an app on the phone, the camera then gives you an amazing 10x or 25x optical zoom (instead of digital zoom), rivaling DLSR or other advanced cameras. The devices can also record video (there's an internal microphone for audio) and footage gets saved on a microSD card.